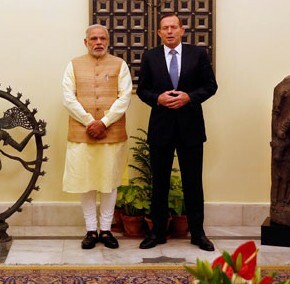 Hot this week: Back to India for two looted National Gallery of Australia pieces. A real push to try to protect Haitian historical artefacts. Things like cannons and such are a target, not to mention shipwrecks. Allegedly 40 iron cannons were looted from a Spanish galleon wreck north of Freeport. The looters apparently used a large, blue hulled salvage vessel. If ANYONE has seen anything along these lines in either the Bahamas or in Florida, or if you know anything about this (seen cannons for sale? heard of weird scrap dealings) please email HunleyFinder@Yahoo.com. The pieces were stolen from a church in Lima in 2008. Eight of them were tracked to an auction house in Iowa who turned them over to the feds after the feds, well, told them to turn them over. The last painting was found to be at a New York auction house. Because everyone involved in this just handed back the paintings, it looks like there will be no prosecutions of these people for handling stolen goods. They are just out whatever money they paid which, frankly, isn’t enough. Another complicated and sad case where Native American pieces ended up being bought at a European auction so that they could be returned. This is not a solution to the problem, it is a problem in itself. A complicated situation: an amazing street photographer dies with no clear heirs and her work is scattered to whoever is buying it up for far less than they should be paying for it. I am not sure this is really a win, so to speak, but the Morgantina silver, which was horribly looted and repatriated to Sicily in 2010, is going back on display at the me as per the repatriation agreement. Australian taxpayers: your museum spent millions on these. You should be very angry at them for buying obviously stolen goods. You aren’t going to get the money back from the dealer, it is just gone. With 22 reported idol thefts in the past 6 years, this short piece is sort of a rundown of all of them. Much the same as the one before. A discussion of the storage conditions of many Indian idols. The author believes that they are poor and this is what leads to damage and theft. A shop owner in Punjab is accused of not turning over to the Archaeological Survey of India all of the artifacts he found during construction work. The 557 artefacts looted from Ban Chiang and trafficked into the US where they ended up in the Bowers Museum in California have been returned to Thailand. A note: I have included a couple articles here on IS+antiquities, but have left out most that were published this week. It is getting to the point where all these articles do it quote each other and offer nearly nothing of any substance. Stories about stories are becoming the story and I don’t think that is helpful or useful. I don’t think a lot of the reporting is solid and believable anyway. From this point on I am only going to include IS+antiquities stories if they either have something new and useful to offer or if they are so bad that they need to be publicly shamed. A look at Omara Khan Masoudi who led museum workers in transferring cultural property to secure locations in Kabul in the 90s before the museum was bombed and looted. A museum worker was attacked and 2 Soviet-era flags were stolen from the Mikhail Frunze Museum. Well, sorta…they stole COPIES of the flags. The originals are in Moscow. A far more logical assertion out of the region. IS is not actively looting archaeological sites themselves and selling the pieces (which, of course, would be remarkably stupid and unprofitable), they are place a tax on looting archaeological sites and skim off the top. I, of course, want to see the real evidence for this, but at least this is less unreasonable than most of what is being printed. In contrast is this article which is unnuanced and cites…journalists. At least they quote Sam Hardy at the end as a voice of reason. Nice to see Trafficking Culture mentioned in this article, but I can’t support nearly all of the numbers quoted in this piece. These IS news items are all starting to swirl together. Please stop using “Monuments Men” to describe real work that people, many of them women, are trying to do. Seriously. It cheapens the content of any article. There is some good enough info in this piece though so don’t let my ranting keep you from it. You know, the slow reveal of these pieces is actually pretty exciting. I like it. If you recall, the sentence is against former FSB officers and the bible was taken from Moscow State University. An interesting long read about the loss of Greek antiquities during WWII. A group of metal detectorists are upset that the Whitstable Oyster Fishery Company has told them they can’t detect on a private beach. The Company says they have NEVER given permission to detectorists and the detectorists claim they have been detecting there (seemingly illegally) for years. Huh. Detectorists are looting this scheduled ancient monument. About 50 holes have been found. This is, of course, illegal. After two metal detectorist stories comes this and it is pretty awesome. Coins used as part of Live Action Role Playing are being found by confused metal detectorists who, I don’t know, probably think they are worth something. The photos were taken by Eric Shipton during the ’51 Everest expedition. Included because a) I have an Everest obsession, and b) Yeti cultural property trafficking is a thing. Nine uniforms and two silver helmets of the Life Guards and Blues And Royals regiments of the Household Cavalry taken from a uniform outfitter in London. Importing using the same methods as antiquities: pretend it is a fake.